Last week, I introduced you to what Anxiety can look and feel like. Anxiety manifests in physical, emotional, and cognitive symptoms. If you missed last week’s blog, click here to read it. 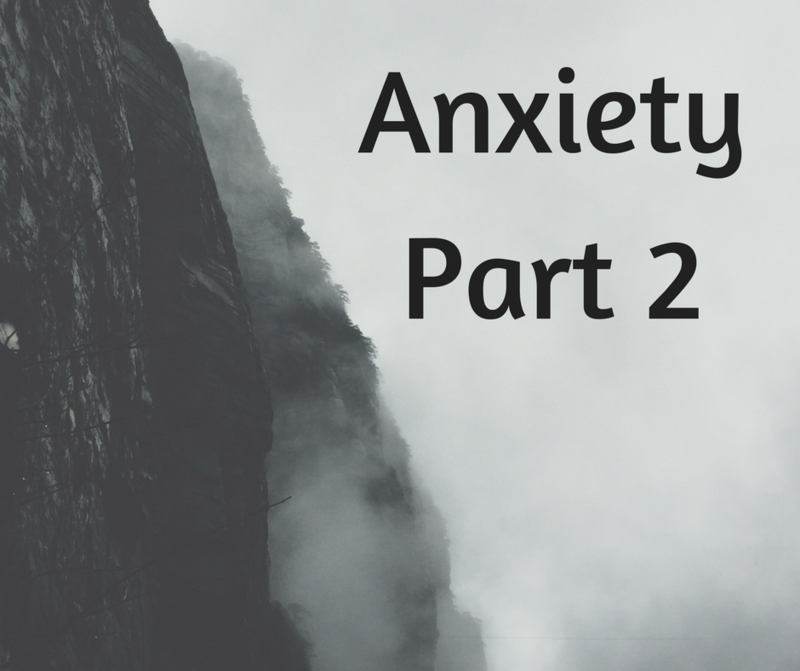 This week, I will be talking about where Anxiety comes from, and treatment options that are available. Anxiety can look and feel different to each person. Please keep in mind that there is a not a one-size-fits-all approach to experiencing and treating it. There are many causes of Anxiety. I’m going to highlight the most common ones here. I frequently get asked by clients if it is inherited. Genetics can absolutely impact the chance of having Anxiety! Researchers have connected that neurotransmitter production issues can be passed from one generation to the next. According to the Mayo Clinic, you are more likely to experience Anxiety if you have a blood relative who also has it. Some personality types are also just more prone to develop it. Natural worriers, planners, and those that are Type A are more likely. It’s also common to be anxious if a child grows up in a family where it was modeled. Parents that are anxious can have a negative impact on the child. Imagine a child who grows up in a home with a mother who has a fear that if her child plays outside alone, the child may get kidnapped. This mother teaches the child to fear something that statistically probably won’t happen. Children who witness fear growing up are more likely to live in it as adults. Gender can definitely impact the likelihood of being anxious. Women are twice as likely to develop Anxiety disorders as men are, according to University of Maryland Medical Center. However, this doesn’t mean that men don’t experience it! I have worked with many men who suffer from it. Having Anxiety does not mean you are “weak” or that you have lost your power. Excessive worry about a variety of topics, activities, or events for 6 months or more. The worry causes physical and cognitive symptoms. Victims of trauma are at a higher risk of developing Anxiety. Trauma impacts one’s view of the world. What once felt safe no longer feels that way. Trauma can cause individuals to feel an intense fear and an immediate loss of control. If you have experienced trauma and are struggling with Anxiety, you are not alone! Other causes include illnesses, the death of a loved one, or other types of grief. Anxiousness can also be due to a complicated life situation. For example, money stress, anticipating losing a job, or a big life change can cause stress. If you are struggling to process through any big life events, and are experiencing Anxiety because of it, please reach out for help! Anxiety can also be caused by an imbalance of hormones or neurotransmitters in the brain. Neurotransmitters such as GABA, serotonin, dopamine, and epinephrine exist in our brains. An imbalance in any neurotransmitter can cause worry, rumination, and irrational thoughts. As a result, the brain tricks a person to perceive a threat that is not really there. Therapy is a very effective way to treat anxiousness. There is power in processing your fears and worries out loud with a therapist. Therapists can help validate feelings. Therapy is also effective in helping you see unhealthy ways of thinking. Cognitive Behavioral Therapy (CBT) is the most common type of therapy for it. CBT teaches you how your thoughts and feelings impact your actions. It also helps you to identify distorted and negative thinking patterns. Therapy also teaches coping mechanisms or coping skills to battle Anxiety. Simple tools such as mindfulness techniques, deep breathing, and relaxation techniques can all be effective. Other helpful coping mechanisms include exercise, reading, music, and yoga. Medications can help decrease Anxiety. Anti-depressants are sometimes prescribed. The most common type of Anti-depressants are SSRI’s (selective serotonin reuptake inhibitors) or SNRI’s (serotonin and norepinephrine reuptake inhibitors). Benzodiazepines, such as Xanax, Klonopin, and Atavin are also helpful for treatment. Medication is not for every person, but can definitely make the symptoms more manageable and life more enjoyable. If you experience Anxiety, you know that it can be not only a nuisance, but can also impact your well-being. You don’t have to go through it alone! Find a friend who also experiences Anxiety that can be a confidant. Attempt to implement some coping mechanisms and learn ways to relax. If you are struggling, please reach out for professional help! Anxiety does not have to run your life. There is help and many treatments options available.